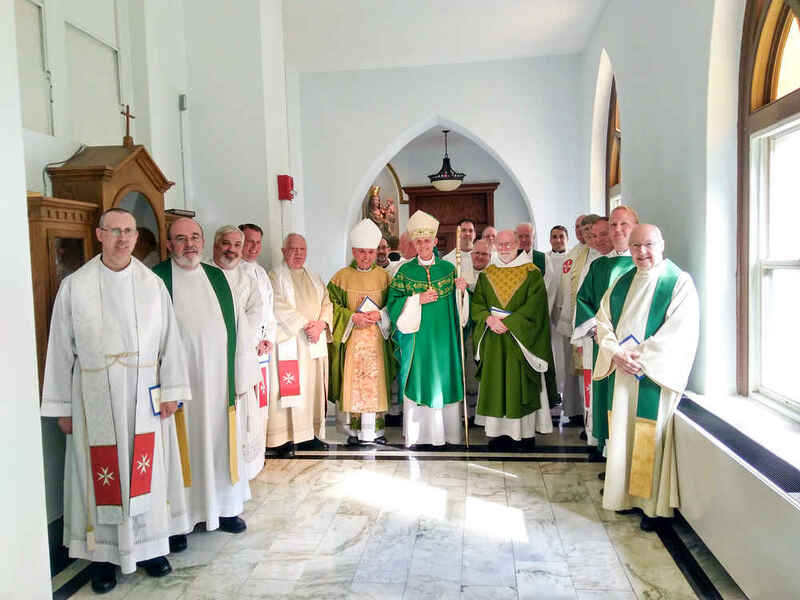 At the end of June, chaplains of the Federal Association met for two days at the Dominican House of Studies, in Washington, D.C. for the second formal convocation of chaplains. This recent meeting brought the chaplains together with Margaret Melady, president of the Federal Association, three professed knights, and Joseph Metz, regent of the Subpriory of Our Lady of Lourdes. The discussion centered on the formation of the chaplains themselves with an additional focus on the selection of chaplains. In the existing system, chaplains are nominated by the local region, with the consent of the bishop, and appointed by the Federal Association board. Beyond that there is no specific program of formation or training of those appointed other than having them serve as associate chaplains for three years. The general consensus of the chaplains in the assembly was that some system should be developed so chaplains will be better acquainted with the history and functioning of the Order. This would give them a better base from which to help members, including candidates for the Promise of Obedience class, in their individual spiritual formation and development. The assembled group presented a number of suggestions to the president, among them a proposal that chaplains should be invited to participate in the annual Day of Formation as part of their introduction to the Order. During the convocation, the chaplains concelebrated Mass with Cardinal Donald Wuerl, archbishop of Washington and Principal Chaplain of the Federal Association. They also heard presentations by Joseph Metz, Regent of the Sub-priory of Our Lady of Lourdes, on the requirements for and preparation of candidates for the Promise of Obedience. Thomas Wessels, president of Malteser Americas, made a presentation on the work of the Order in disaster relief throughout North and South America, and Kate Robinson of the Holy Family Hospital of Bethlehem Foundation also presented. The gathering included both a panel of chaplain presenters and a general discussion about the individual activities that take place in the regions that comprise the Federal Association.